Micro Scooters have a fantastic reputation. Anyone who has one will always recommend them to those that ask for advice. Once you try them (or your kids try one) you soon realise why. They are so smooth to ride, effortless for children to control and last forever. Nearly all of the children that I nannied for in the past, had a Micro Scooter and so I knew just how great they were. This is our Mini Micro. We call it light red but in actual fact, it is a faded pink one. It was new to us but second-hand in reality. Possibly third as it came from a family with two girls. The youngest was getting a new one and so we bought it from them. Bear has played with it for about 2.5 years as he wasn’t 3 yrs old when we got it. The design, with the two wheels at the front, makes it so much easier for younger children to balance on and instead of turning the handle to change direction, which can unbalance younger children, they just need to gently lean in the direction that they would like to travel. It also means that when they get off, it doesn’t swing round and hit them on the ankle. It’s suitable for children aged 3-5yrs. The Micro Mini also comes with a rear brake but you can’t see that in our picture as it sadly came off. If this were to happen to you (although unlikely unless it’s a similar age to ours) you can replace it or indeed most parts of the scooter. You can actually design it to your own specifications from the very beginning and make a ‘one of a kind’ Micro Scooter. Our Mini Micro still has some life in it – Bear is ready for an upgrade but with a bit of love, our scooter could go on to be great fun for another child. I could sell it on for a couple of pounds but it may end up in landfill in a year or so. Instead, we are donating it to under privileged children or those suffering with illness via Micro Scooter’s initiative, Scooter Aid. So now, our old faithful Mini Micro is being revamped, parts replaced and being prepared to make another child smile and help with their physical development. Which Micro Scooter should I buy? Bear was venturing off the path and into the Skate Park. 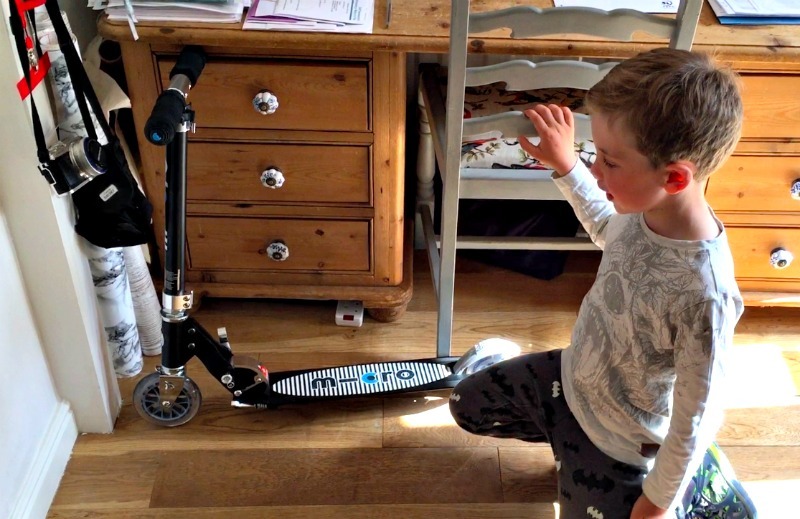 He had stopped scooting as a way to reach a destination or trying to go as fast as he could, and was now wanting to learn how to do tricks and tackle ramps. Eeeeeekkkk.. 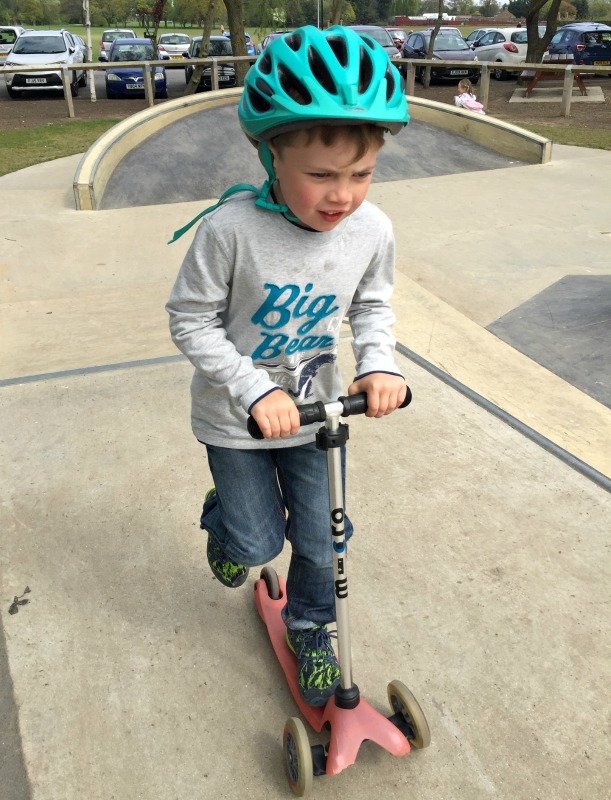 He first started on his Mini Micro and it was a great introduction as he felt safe and secure on it and it helped build his confidence to try the steeper and higher ramps. But, as much as the two wheels at the front was perfect when he was younger and on paths, it wasn’t so good at going round curved, inclined ramps. We’ve made a video of both scooters in action which is below and so you can see what I mean. We were very lucky that Micro Scooter offered us the chance to choose a scooter of our choice to review. I went back and forth between two scooters. The Micro Sprite and the Micro MX Trix. ..the Micro Sprite provides the perfect introduction to two-wheeled scooting because it is lightweight, easy to manage and durable. The Micro Sprite steers like a bike allowing your child to master their scooter quickly. 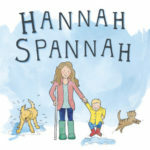 It has great little extra features such as a kickstand which enables it to stand, it folds for easy transportation – either in the car or with the addition of a carrying strap, on your shoulder or on the back of a younger sibling’s buggy on the school run. This was a particularly appealing feature for me as most of the skate parks Bear likes to go to, are a car ride away and if we have the dog in the boot, it being folded in the foot well is safer than it being full – size in the back with him. The handlebar is also adjustable which is a bonus as Bear is growing at a rapid rate and anything that prolongs the life of the scooter is perfect. 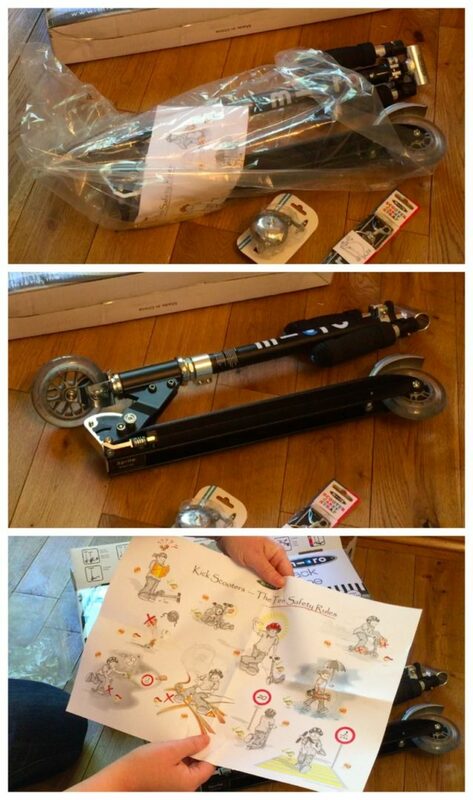 Additionally, you can buy a number of accessories or choose purchase packs to personalise the scooter to your taste. 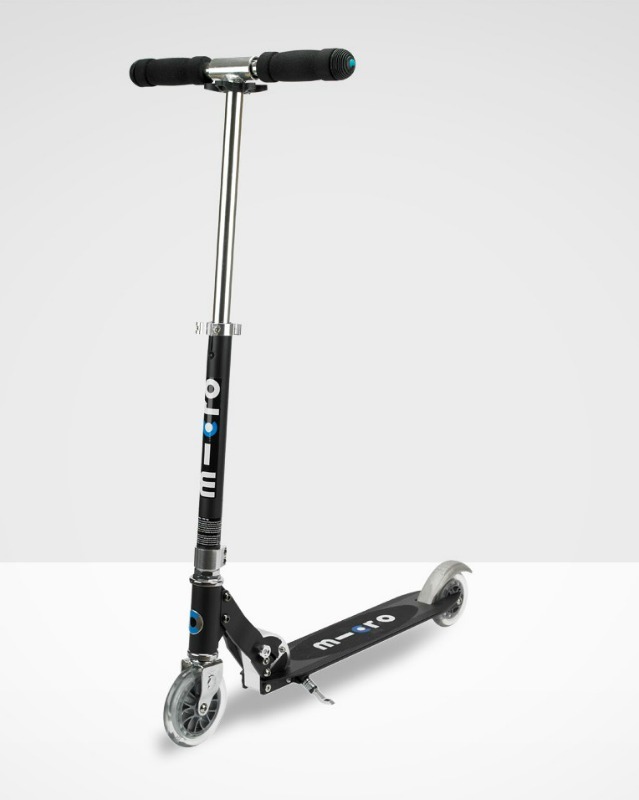 This quick and nimble scooter has been engineered in lightweight aluminium meaning that it’s very easy to manoeuvre for younger riders. 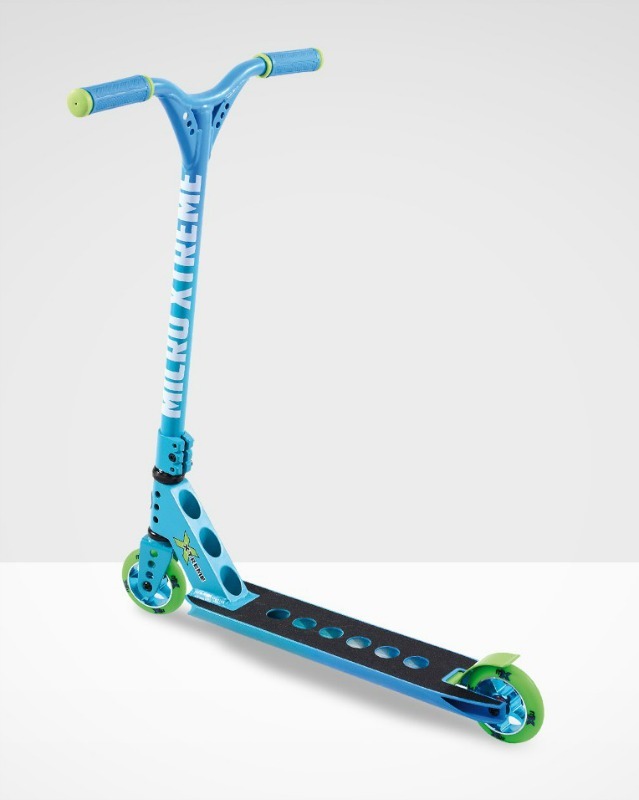 The footplate and handlebars are substantially shorter than other scooters, making this model the perfect choice for practicing tricks and stunts. It was a really hard decision to make but the folding ability of the Sprite, the adjustable handle bar, along with the kickstand and the fact that we could use a carry strap to make it truly portable, made it the one for us. Bear loved the design of the ‘Black Stripe’ Sprite and that was that, the decision was made. I think that if Bear were maybe 7 yrs old, we would have gone for the stunt scooter but he may easily fall out of love with stunt scooting and so the Sprite it was. It arrived by courier, in the box above, wrapped in a protective plastic bag. I couldn’t wait and opened it before Bear came home from school – I wanted it put together and ready in all it’s glory for him. 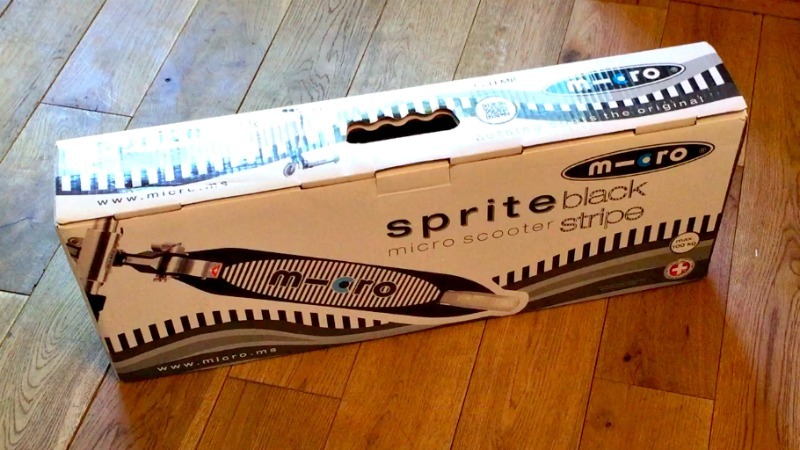 Inside the box was the Sprite Scooter, fully put together, an instruction manual, a safety poster and also a bell and carry strap that were and still are part of a special offer available on site. The Sprite, is, in theory, easy to unfold and ‘put together’. However, I found it ridiculously hard. I spent ages trying to get it unfolded and as you can see, tried brute force in the end, before I worked it out. The instructions say to ‘push down locking button’. I located the locking button and tried to push it down. I tried to push it any-which way but it wasn’t going anywhere and no amount of wiggling or pulling was going to open it. I FINALLY, and accidentally worked it out and it’s simply down to a misunderstanding of words. I think push down means to push it down towards the floor whereas what you are meant to do is push the button IN as in, press the button / apply pressure. When you do this, the handle bar column instantly releases. You push the handle bar up, let go of the button and it clicks into place. Voila. You then tighten it following the instructions, click the handle bars into the column and the Sprite is complete. Bear’s face when he first saw it was a picture. He immediately got onto the scooter and rode around the house. The next step was to adjust the handle bars to a comfortable position and then we were off to the local skate park at Bear’s request. I have to add that the Micro Sprite can hold up to 100 kg and is suitable for adults. I did have a little ride around the house and it was exceptionally smooth. Watch to see both the Mini Micro and the Micro Sprite in action. What do we think of the Micro Sprite? We love it. The scooter is perfect for Bear and it is unbelievably smooth to ride on. 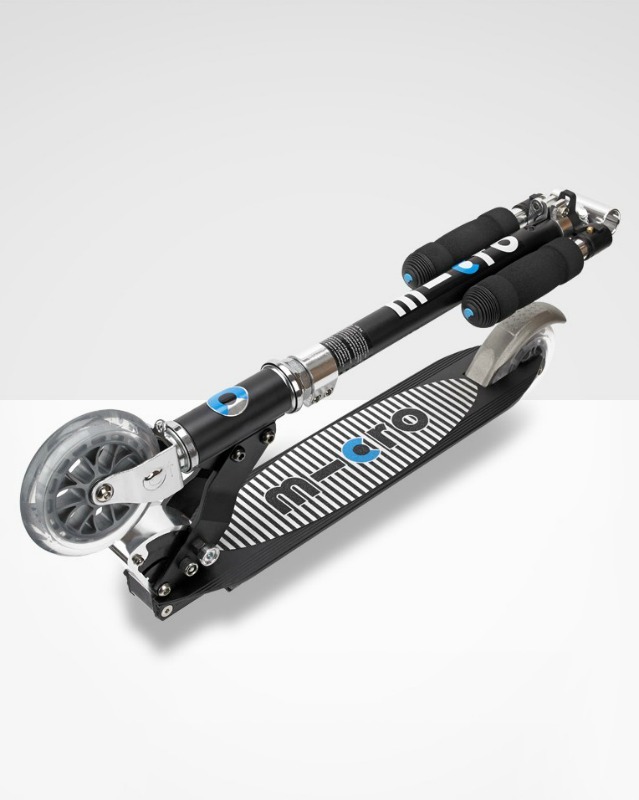 The handles are padded which make the grip safer and also the foot board is rough like sandpaper, helping the weight-bearing foot stay in place. I have no idea if it is any good for doing stunts on but for Bear’s level, it’s just right. A stunt scooter with less comfort may be better for jumps but for a 5-year-old who is just having a go, the Sprite fulfils all our needs. Bear is so proud of it that he often goes up to the big kids at the skate park and shows them that it has a stand and a carry strap. Bless him. Thankfully, the teens have been welcoming to him. An older boy, well man I guess as I think he said he was 20 yrs, asked if he could have a go on his scooter and Bear allowed. He came back and told me that he really liked it and that it was really smooth and comfy. I could tell from listening to the other scooters go by, that there is a difference in the material that the wheels are made of – they sound so much louder and harsher and I can imagine that vibrations shoot up the handlebars. 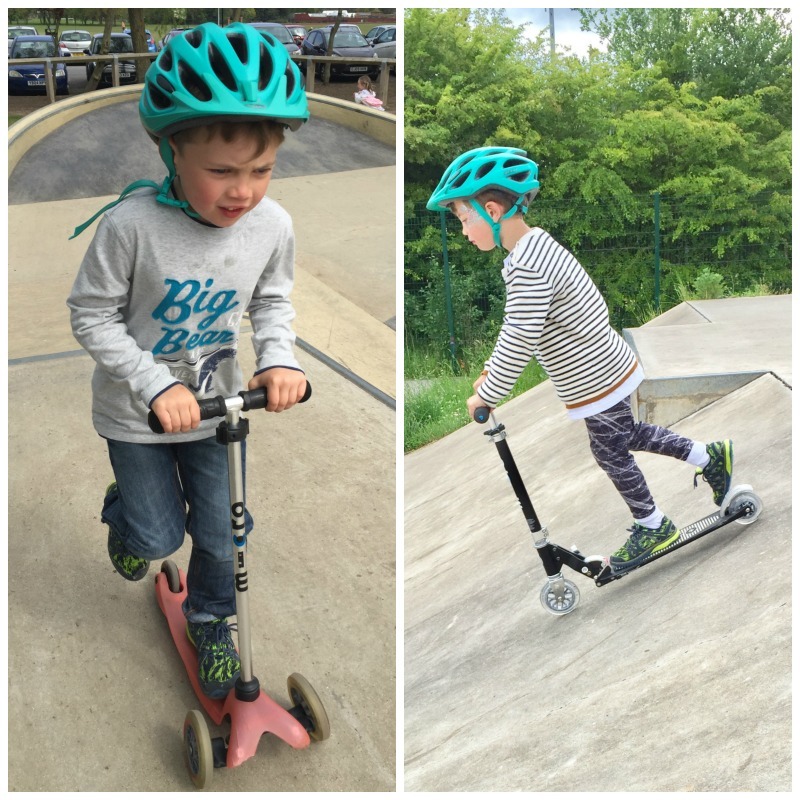 We really recommend Micro Scooters and that’s from years as a Nanny as well as being a Mummy. Disclosure: We were sent the Micro Sprite scooter for the purpose of this review but as always, all thoughts and opinions are my own.